So far this season, this headline is becoming a constant feature by almost all British media, as Diego Costa’s demeanour continues to hamper Chelsea. On Saturday during the 1-0 defeat of Chelsea by Stoke, Costa was alleged to have stamped on the foot of a Stoke City steward when he went to retrieve the ball. The incident has since been reported to the referee who, in turn, demanded to speak to Stoke City’s head of health and safety, Ravi Sharma. Although Chelsea have denied that the incident took place, but Costa could be charged if the FA’s investigations find the Spain striker guilty of the allegation. And the 27-year old continues to be the Blues’ main problem this term as if found guilty, he will be made to face as much as a six match ban for repeat offense. 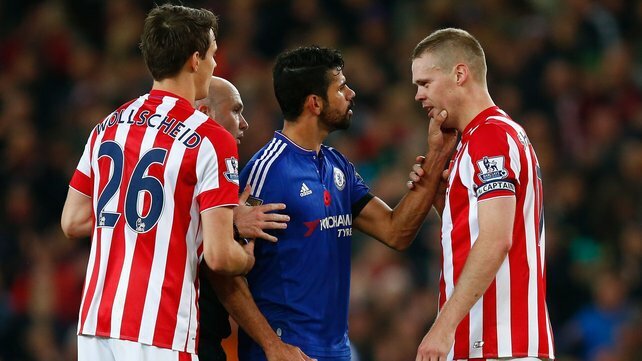 Costa’s overly physical approach was matched by Stoke City’s central defensive partner in Ryan Shawcross and Wolschield. As has always been his way this season, it was Costa’s goading rather than his goals that was again prevalent at the Britannia and it seems Mourinho’s plan – on using the Spaniard to unsettle defences rather than unlock them – is now a flawed one. The Blues’ defensive problems this term is obvious as and were again at the Britannia as Mark Arnautovic was left unmarked to fire in a volley to bag the winner for Stoke, however, where Chelsea’s main problem lies in at the other end of the pitch. Costa was a revelation in his debut campaign in the Premier League, as his powerful and unerring finishing ability helped fire the Blues to the league title and the Capital One Cup. But all is mere memory now and if Chelsea want to get out of this mess, as observed by Goal’s Tom Maston, they need to get Costa firing. The Brazil-born striker is endearing himself to fans of opposition teams as public enemy number one and his goalscoring exploits are no more there. His runs are now aimless and his ball movement abysmal. Hence, it is time for Costa to focus on goalscoring rather than goading, as it is spelling more doom for the Blues and for the striker himself.